A Well-Seasoned Life: Cookbook Review and Giveaway: "At My Grandmother's Knee"
Cookbook Review and Giveaway: "At My Grandmother's Knee"
"Granny, Nana, Mamaw, or Gigi..."
For me, it's Mema. My fondest memory of my Mema is watching her make her hoe bread, a flat biscuit-like bread, for our daily meals. She had a drawer dedicated to her flour bin and made the bread fresh every day. I remember the way her fingers looked as she folded the flour into the milk mixture, the way she pushed the wet dough away from her fingers with her other hand. She flattened the perfect dough on to the greased black-iron griddle and casually flipped it when the first side was done. The result was a crust that was golden brown and crispy - the inside of the bread softer and more delicious than any buttermilk biscuit I've ever eaten in my life. I still taste it in my mind. I've never learned to make her hoe bread and I've regretted the fact. 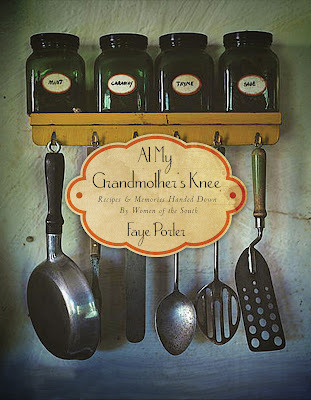 That's what makes At My Grandmother's Knee by Faye Porter such a special cookbook. It captures those special moments spent with our grandmothers in their kitchens. Each recipe is accompanied by a cherished memory submitted by the recipe's contributor. And, I found it very easy to imagine myself pulling up a chair and watching these lovely Southern ladies make these dishes with their loving grandchildren looking on. The contents of the cookbook are divided into breakfast, canning (jams and pickles), beverages, breads, appetizers (include soups and salads), side dishes, main dishes, pies (cobblers), cakes, cookies, chocolate pies (yes, an entire category itself), and miscellaneous desserts. The book is scattered with rustic, full color photographs of various recipes. And, because the recipes are submitted by home cooks, they are simple and hearty, full of hominess. I can't tell you how many recipes I've marked to make in the future. I've included two here but how do these sound to you? Biscuits 'n Chocolate Gravy, Artichoke Seafood Dip, Creamed Chicken on Cornbread, Lemon Mist Pie, and Feel-Better Cookies. Preheat oven to 450 degrees. In a skillet over medium heat, cook, drain, and crumble the sausage. Sift together the flour, baking powder, salt, and baking soda in a medium bowl. Cut the shortening into the flour mixture. Stir in the sausage. Mix the buttermilk into the flour mixture. Knead the dough by hand 10 times on a floured work surface. Roll the dough out to a 1/2-inch thickness. 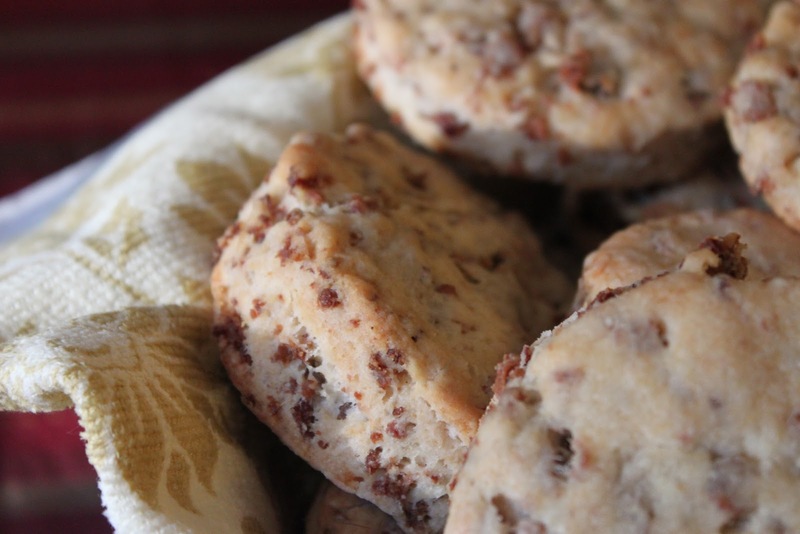 Cut out the biscuits with a biscuit cutter or the rim of a glass and place on an ungreased cookie sheet. Bake for 10 minutes, or until golden brown. Serve Warm. Makes 2 dozen biscuits. P.S. 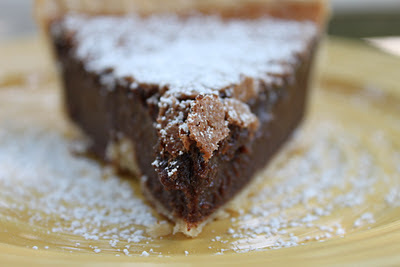 Here's a bonus recipe - Chocolate Chess Pie. Do you think you might like a copy of At My Grandmother's Knee? I hope so because I have a copy of the cookbook for you. I know you'll love it. How do you enter to win? It's simple and I'm going to give you two ways to win. 1. Leave a comment below telling me that you're interested in winning. Share a memory of your grandmother if you'd like. But, please leave me an e-mail address where I can reach you if you're the winner. 2. Like my page (A Well-Seasoned Life) on Facebook and leave a message on the post dedicated to this review. Disclaimer: The publisher provided me with a copy of this cookbook but the opinions here are my own. I would love to win this cookbook...it's exactly the kind of cookbook that I love to read and use. Unfortunately I have no grandmother cooking memories. My paternal grandmother had passed away before I was born and my maternal was quite old and lived with us so didn't do much cooking. This sounds like a really nice cookbook. I would love to win! margaretaleblanc at hotmail dot com. My grandmother made the best turkey stuffing. My siblings and I and our cousins did not want our mothers to make the stuffing it always had to be made by our grandmother. I watched her a lot while I was growing up to come close but no cigar yet with the same taste. This sounds like a book I know I would enjoy. Another great giveway- thank you, Kim! I remember big family dinners at my grandparents' house. My Meena makes the best chicken salad and apple pie. This cookbook looks great, and I would love to have a copy. Oh Kim, this looks like a wonderful traditional old time cooking Cook Book. I just know it would make a great read! I love cookbooks like this. I have Cooking with Clara and it's a favorite of mine. A memory I have with my grandma was watching her make her homemade tortillas. She was the best at that. I would LOVE to win this cookbook! Just the title and cover have won me over! Ma (my momma's mom) would make the best biscuits! I watched her make them and I use the exact ingredients and measurements, but can't ever get them the same. Must have been her seasoned cast iron skillet! I sure do miss her! My Grandma lived with us for the first 10 years of my life, so I have many wonderful memeories of her cooking...along side of my Mom. They were both great cooks & wonderful women. Cherish the memories. I'd love to win your cookbook! I would love to have this cookbook. I lost all of my mothers and grandmothers recipes when our house burned a few years ago. I love good home cooking recipes. I would love to win this cookbook! My maternal grandmother, Grandma Cleva, was my cooking mentor. My paternal grandmother was quite a cook, and she expected all the family at her house every holiday as well as on Sundays. I remember counting 45 people who ate, in shifts, at the table! I'd love to win this book! I have happy memories of baking with my Grandma, particularly around the holidays, when she would make spritz cookies. 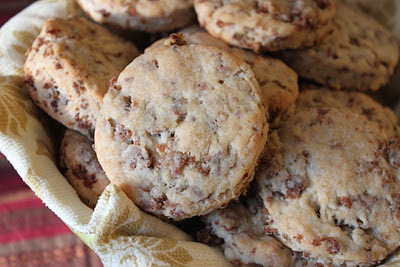 Before the last tray left the oven, we'd start sneaking still-warm cookies from the countertop. We often ate them so quickly that one year, Grandma hid the cookies to save some for Christmas Day. Christmas came and went and our visit ended, with no cookies. It turns out she'd done such a good job of hiding them that she didn't find them until months later! Oooh my laand I would so love this book! Both of my granmother's were really great cooks/bakers but didn't leave recipes behind :( I'd love to glean from other g'ma's cooking and baking! What a fabulous book! I loved my grandmother so much and have many wonderful memories of her. I miss her very much... this book, I'm sure, would bring back many memories! Would also love to win. It's time to try different menus. I'd love to win this cookbook; those with stories and histories of the recipes are so much better. My grandmother was a private chef before I was born so I learned a lot about cooking from her. She could use the most humble of cooking utensils and cookware and come out with the most amazing food. I learned from her that good food owes everything to the best ingredients and nothing to special gadgets. This would be a fantastic cookbook to own --- so different than the "run of the mill" cookbooks we all own. I don't recall much of my grandmother's cooking, but I'd like to read about this grandmother's cooking!